A nice animated video using the voice and words of a 14 year old boy named David. Taking the first step is key in a lot of areas of life. Take for instance our morning running group at Hosmer. Typically we start it up each spring, but I get questions from kids each fall about when we are running again. I have good intentions, but beginning school activities always crowd out these intentions, forcing them to the bottom of my to-do list. 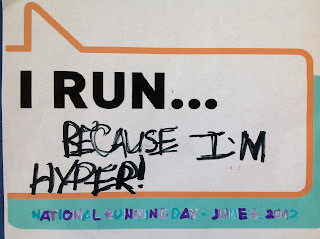 Well, right before Thanksgiving, I printed out two signs, taped them on the door of the school and announced that we were running to start our day. Simple...meet at the big field at 8:00 am and back in at 8:15 am every Monday and Wednesday. Is this a questionable time of year to start an outside activity in the Northeast? Yes! Are we doing it anyway? Yes...and that is exactly why we are doing it! Doing the "unexpected" adds fun to your life. Every spring the big field by our school wakes up and beckons us to romp on it before the school bell rings. Twice a week about 10 - 30 students meet to run. It is a great way to connect with nature and get needed movement before the dominant activity is sitting on the rug or at desk and chairs. 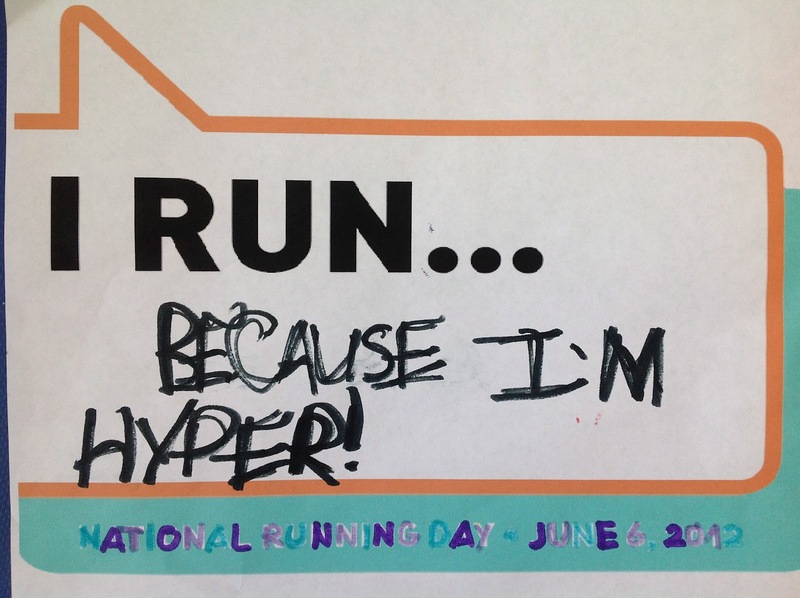 Running promotes that "feel good" sense. The students enter the building with a smile. There may be more hidden benefits as well. A dose of nature has been linked to improved attention as well as less vision problems. 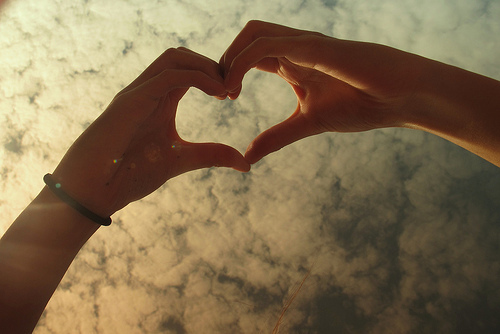 When something is special, you want to share it. 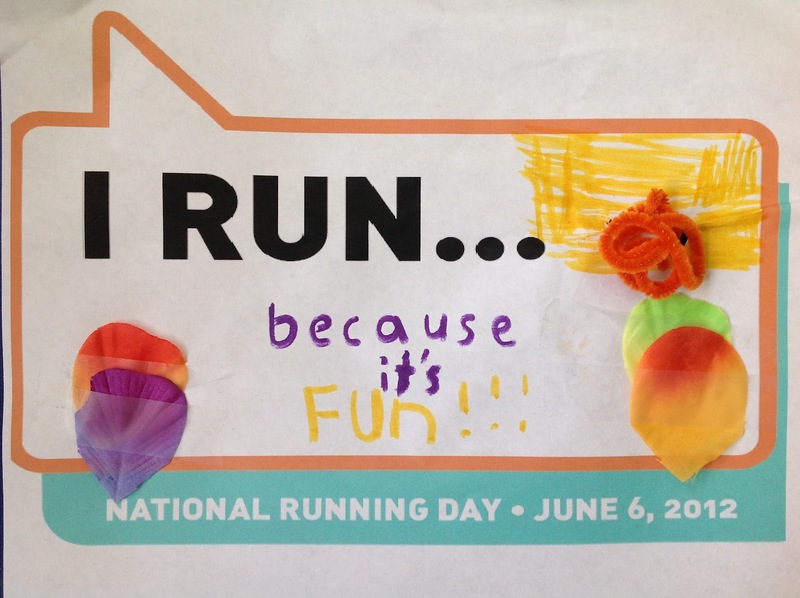 National Running Day is this Wednesday, June 6. It presents us with a golden opportunity to get others to join us. We are hoping to entice teachers, families and other students to experience the joy of moving outdoors together. 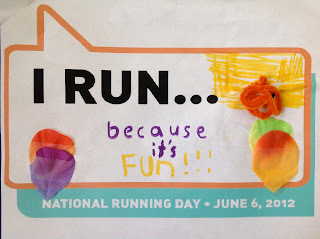 We all have our own reasons why we run. Why not start a group running this Wednesday yourself? 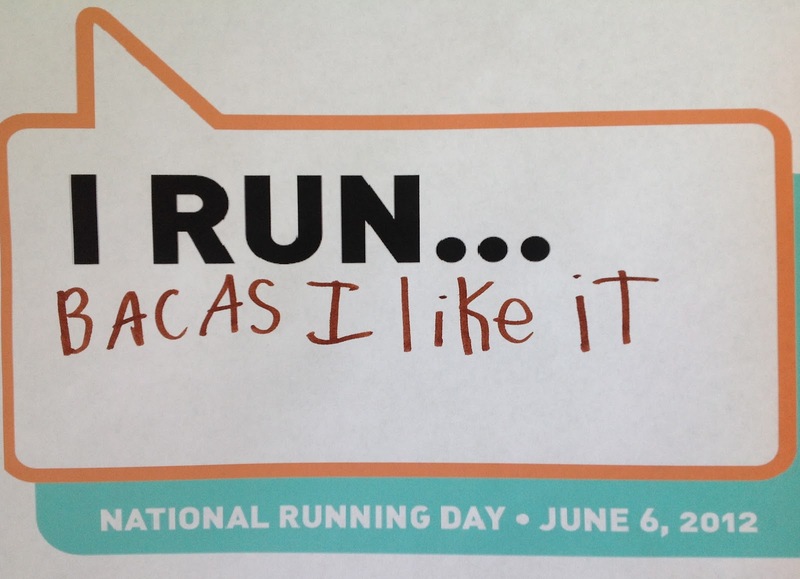 Check out the National Running Day website here. I love using my finger on the iPad to write and draw. How about you? There may be times you want a stylus to draw, write and navigate. Before you head out to buy one, try this one first. It is so simple, you won't believe it when it works. Introducing the two minute stylus. You can find the directions and watch a video here. That's it. Enjoy the magic! 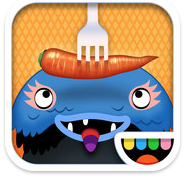 Toca Kitchen Monsters, another great app by Toca Boca, is free today. Cook food for two monsters. Play with your food. Do you have students who eat limited diets? This is the app for them. Let them explore food in a non threatening way. Maybe there will be young Jamie Olivers finding their passions because of this! 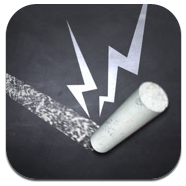 Autism Track by HandHold Adaptive® is free today (April 2) in honor of World Autism Awareness Day. Typically it is $49.99, so grab it now! It is a journaling tool that empowers caregivers of those with autism to easily track interventions, behaviors and symptoms. 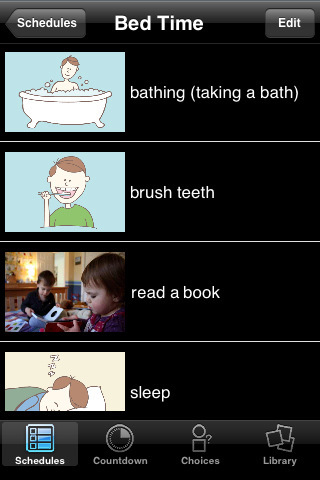 Checkboxes allow daily recording of any therapy, medicine or diet. Simple “sliders” allow rating of any behavior or symptom (e.g., eye contact, aggression and echolalic speech). Help your team to answer the question, "What is working and what is not?" I am constantly amazed by the iPad. Part of the reason is the apps that are being developed for it. I came across this one just this morning as I sipped by coffee. It seems too good to be true. 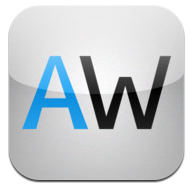 AppWriter offers word prediction, OCR, text to speech and Dyslexie font. I am dying to get my hands on it to try it out. I already know several students who could benefit from this app. One student is in her first year of high school. I remember recommending a laptop for her in fifth grade. With it we ordered word prediction software, a scanner and a portable printer. 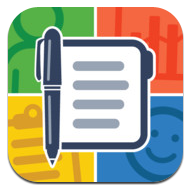 This $19.99 app might do a good job of replacing all that for certain school tasks. If anyone remembers the difficulty of scanning in and sharing documents, this is a relief! I find that many people want to give. All you need to do is ask. Here is my latest request. I handed this container to my husband on his way to play squash today. 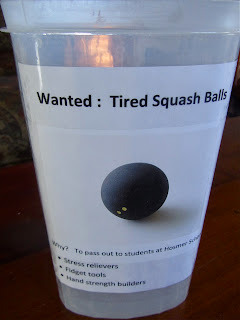 Squash balls make great stress relievers, fidget tools and hand strength builders. We keep a steady supply to pass out to classrooms. 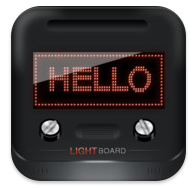 Light Board puts your message in lights as a scrolling marquee. 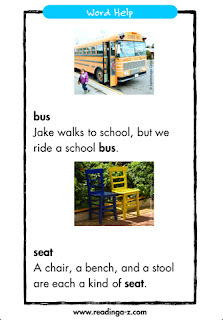 How engaging that would be for students to practice their name or spelling words. They say it is free for one day only so grab it now! Quick - I Need a Heart! 1. Use two hands. Put a crayon in each hand. Have them start at a single point. Now they draw lines simultaneously, moving their hands up, out away from each other and then travel along a diagonal towards each other. 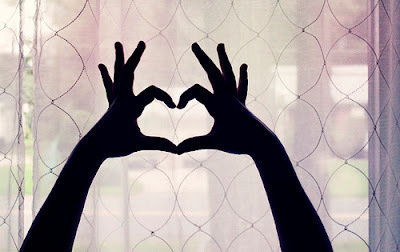 Two handed heart drawing can be done by younger kids quite easily. 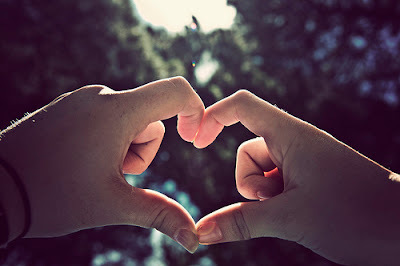 Their heart is symmetrical! Hint...have them draw this on a vertical surface by taping the paper to the wall. 2. Do they know their letters? Have them practice a modified m (it sort of looks like what people draw as a simple image for birds in the air). 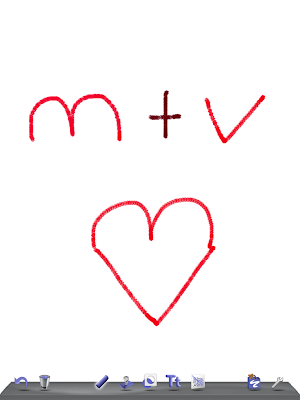 Have them draw a v. Now tell them they can draw a heart. 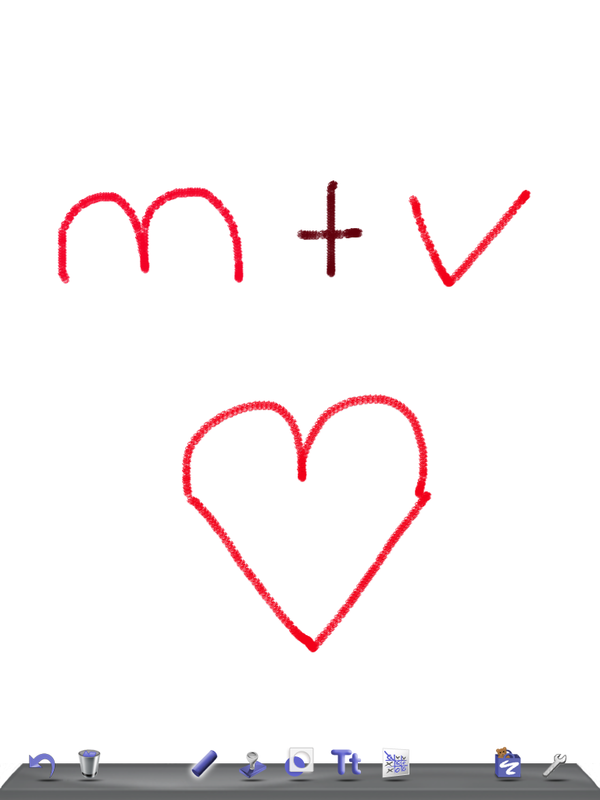 Simply draw a m and attach a v under it (make sure you start the v at one end of the m and finish it at the other end. Click here for a video demonstration. 3. 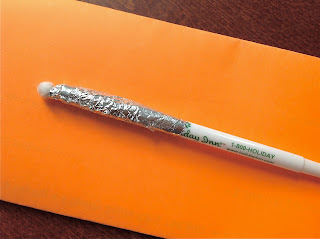 Finally, find an old paper tube and fold it in half...one end is a point. 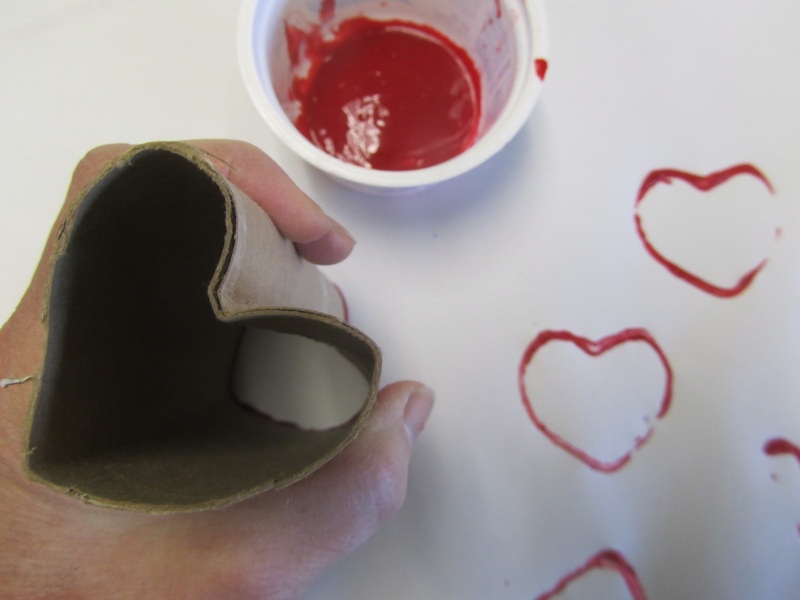 Reverse the fold on the other end to make the top of the heart. 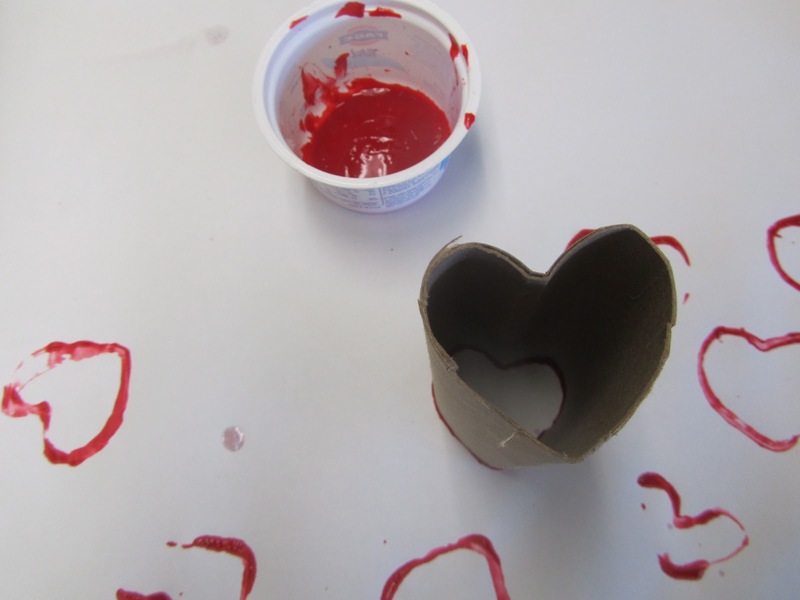 The student grasps the tube in a way that maintains a heart shape. Dip the end in paint and stamp on paper. This gesture involves separating the sides of the hands, needed to hold a pencil correctly. 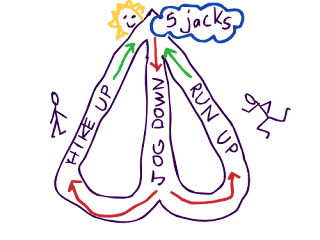 Do your students curls in their last two fingers when writing? Greet each student today with a friendly heart sign and have them imitate you...can they do all three? "Learn by Doing" is the foundation of occupational therapy. Mary Reilly said this best in her statement, "Man, through the use of his hands, as they are energized by mind and will, can influence the state of his own health." As a school based occupational therapist, I would like to say they definitely can influence the state of one's own learning. Good Magazine's article Can Schools Create a Culture of Learning By Doing? talks about this very topic. A discussion was sparked by a group of educators sitting together in a session at EduCon, an education innovation conference where the sessions are designed as conversations rather than presentations. The group asked the question, "What if schools created a culture of "DO" instead of a culture of "KNOW?" 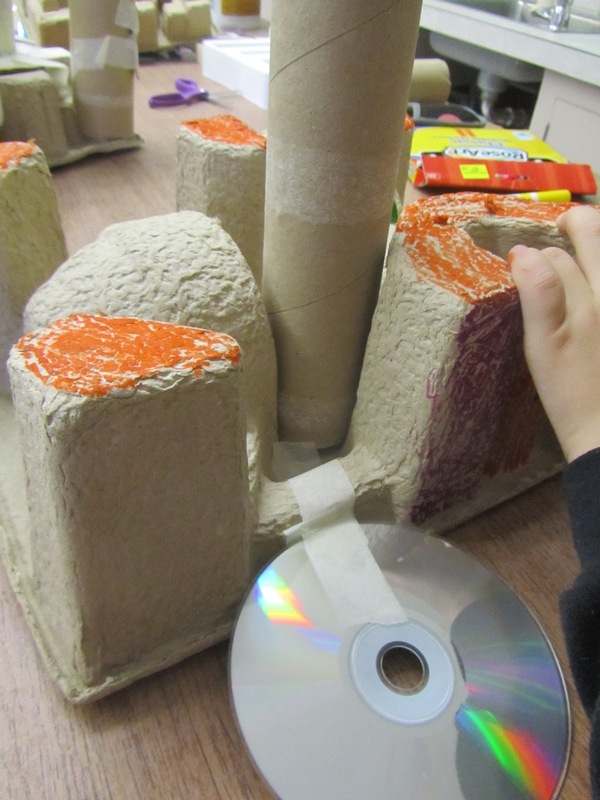 After considering how to move forward, they took steps toward learning by doing in their own school, like introducing "meaningful tasks" into the classroom experience. Every month I am trying to mix things up in our room at school. Last month it was painting and drawing upside down. This month I pulled out the "make it - take it" table. I threw recyclables into our sand table, provided scissors and added a fresh roll of masking tape (don't you hate it when it it old and you can't peel off a decent piece)? I have been amazed at what the kids are making. I am even more amazed at their enjoyment of the process. 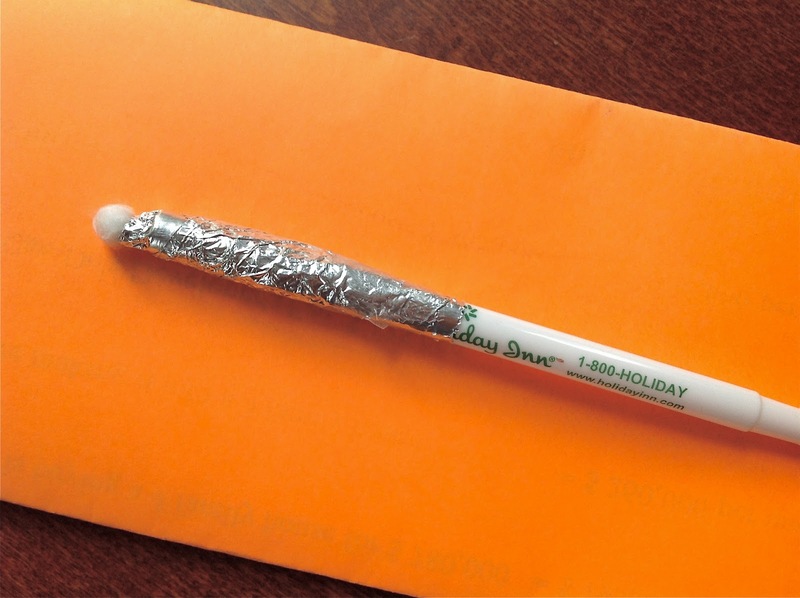 So often we resort to paper/pencil tasks to give to kids. Our hands are rich with neural connections, both sensory and motor wise. Why limit them to a pencil or crayon? Let them make stuff. These kids were learning through their creations - they problem solved, designed and assembled. All in a day's work at school. Help students take risks. Embrace mistakes and let kids learn from them. If they fall, help them back up again. Kids have passions. One common one is sports. I often try to encourage writing around a child's particular area of interest. Starting with an image can be useful. If you have a student who is really into football, try putting them side by side with their favorite player. 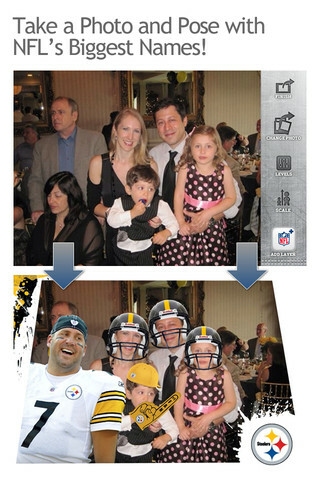 NFL Photo Booth allows you to take photos with NFL players, jerseys and gear. It's free and just in time for the Superbowl frenzy. Go Pats! 1. It took a lot of time! The more I did something, the more it became routine however. Some of the mechanical tasks became faster (thank goodness). 2. I learned it was better to be simple. I stepped back to look at the design of my blog and made changes over the past month. 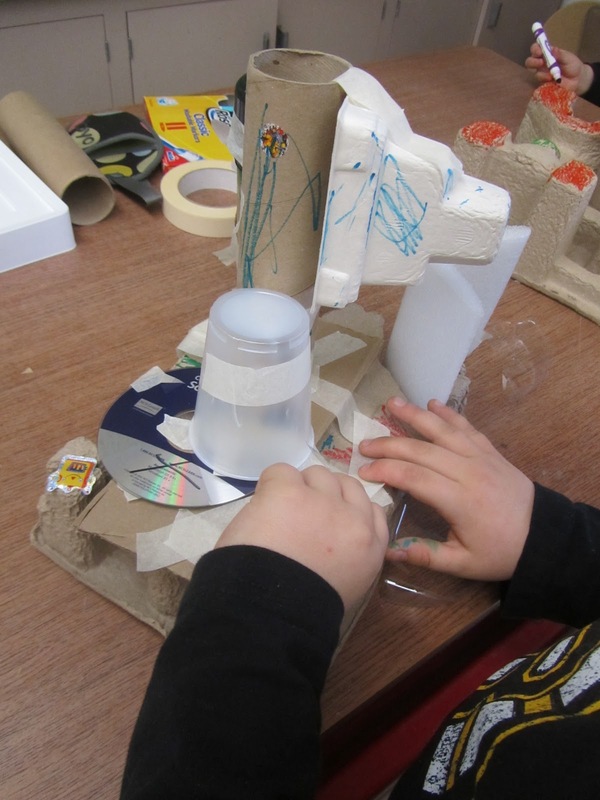 This came from looking at other blogs such as Art Mind and Modern Parents Messy Kids. They typically use one large image in the center of the post. I was trying way to hard to resize and place images side by side. This finagling also ate up a lot of time. The layout of some of my posts would have made my high school English teacher, Mr. Connor, cringe. He was also the year book editor and I learned so much about white space and placing elements on the page. I now try to place one large centered image for a cleaner look and to save time. If I need to combine images, I'll try to make a single mosaic picture using Flickr tools. 3. I learned frustration tolerance and how to stay calm. Once I tried to change settings, eliminating one of my authoring accounts (I had two under different emails). It was the one that had administrative power. For a moment I thought I deleted the whole blog! With a little patience, I got it back up and running. 4. I learned a little more about HTML...enough to realize I like WYSIWYG much better! 5. I learned about many of the apps on my iPad. I often download one and then go off to work on other things. If I was writing about them, I had to understand the ins and out. The pleasant outcome of this work was that I applied what I learned to use at school with my students. 6. I learned to be reflective and edit before posting...I am still learning this one. Yes, I know about the "preview feature," but sometimes I am too quick to hit "publish." After, I would view the blog post and change it several times (my perfectionism coming out, I guess). That was until I read Sean Sweeney's post apologizing for editing a post. Apparently, people who receive email updates don't necessarily see the corrected post. Whoops. 7. I learned to connect and drive business to readers. If I was spending this much time, I had to think of ways to share it. I remembered to use Twitter to send it out to the masses. I created a Thriving in School Facebook page to drive traffic. I labeled each post so they are searchable (still trying to catch up with this one). 8. I learned to present with humor. Although I think the topics are important to the learning and lives of our students, I approach it with a spirit of fun. It makes the "doing" more enjoyable. Martin Luther King, Jr. encouraged everyone to participate in civic life, so a wonderful way to remember him is to give something to your community. Check out City Year or Volunteers Match programs near you for sponsored events or make up your own. Download this free book in honor of Martin Luther King Day. I wish I had this last week when one of the classrooms I work in was talking about this very subject. 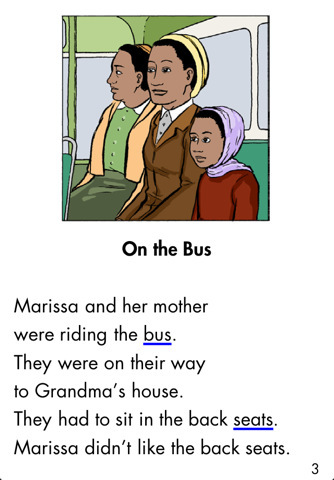 The story of Rosa Parks is told through a young girl's eyes. The message is that one person can make a difference and that people make change by joining together. This book offers word help on underlined words. 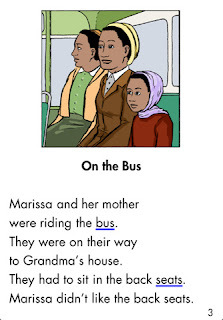 The page flips over to give added explanations and picture support for comprehension. 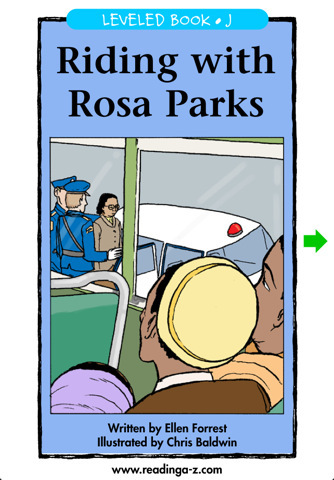 Rosa Parks (level J) is part of Reading a-z leveled book series. They have created a list of itunes books according to reading levels and offer one free book app at each level. After volunteering with your community, curl up with a good book! Established routines are comforting and supportive of Sensory Avoiders. It helps them know what is going on and what is up next. Consistency is key. Having such low thresholds means they are met frequently and this is uncomfortable and frightening to them. Overall, Avoiders want to keep these events from occurring. You may see withdrawal or emotional outbursts to help get them out of a threatening situation. One strategy they use is to create strict rituals to prevent these events from happening. Although they might appear as controlling and stubborn, they are seeking ways to limit sensory input to those that are familiar and easy to interpret. Change brings the unexpected...things that may be too loud, too itchy, too visually confusing. Help them by creating routines and introducing small changes so they can can adapt. 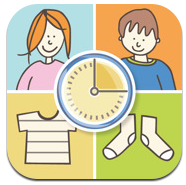 Video Scheduler ($12.99) is an app that lets you use photos or video to create schedules. You can set up multiple users, handy for a school based occupational therapist working with a caseload of youngsters. This allows you to keep multiple routines under a specific user's name. Label each step or event with text. Add a photo (take one using the camera or choose one from your camera roll). Finally add an audio comment explaining what to do...so cool! If you have the iPad2 or camera enabled iPod touch, you can take video for each step instead of the photo and audio comment. These videos can target exactly what you want the child to model. When you choose a schedule, you see the linear list view of the steps. When touching the step, the photo/video associated with it fills the screen and you hear the audio prompt or the video playing. Even though you can do great things without the camera in older devices, this app takes full advantage of the camera and video capabilities of the iPad 2. Video modeling is considered an evidence-based practice and provides an effective tool for instruction, intervention and behavioral supports. I can't wait to upgrade my first generation iPad! 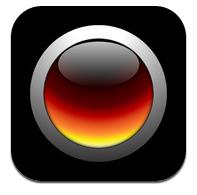 iPrompt ($49.99) is a prompting app that provides picture schedules, visual countdown clocks and choice prompts. Schedules can have many pictures, or just two (a schedule of the day or first - then schedule, for example). 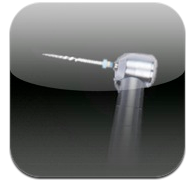 It presents as a linear step view when holding the device vertically. Turn it horizontally and you swipe through each step or event. 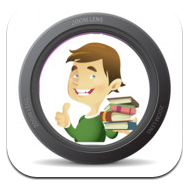 You can use photos and clip art provided by the app or take photos on the fly if you have a camera on your device. Since I am camera-less, I import photos through my camera adapter or search for photos from the Internet without ever leaving the app. Your schedules are saved in a general area (not assigned to individual users). The app recently added videos that you can purchase. 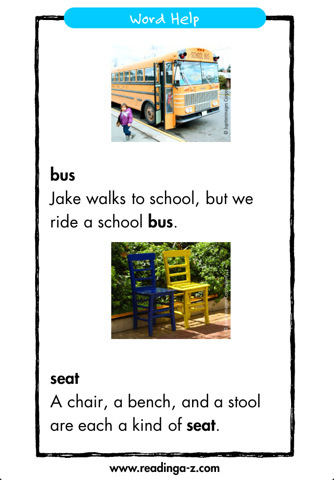 These are pre-made and cover a range of topics from making conversation to manners. They even have a video on the different functions of pencil, pens and markers. I think I will be showing the "playing tag" video to a student of mine who runs and chases in PE class but does not understand the tagging part. This app will make you get rid of those old handmade schedule boards and re-purpose your velcro dots...they make great fidget tools when placed under a desk, by the way. 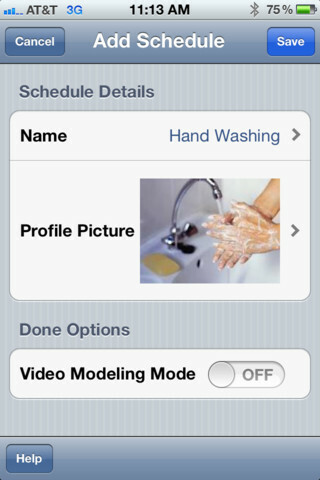 Two other options are First Then Video Schedule ($9.99) and Picture Scheduler ($2.99). Which app suits your needs? The overall approach to intervention for Sensory Avoiders is to offer discriminating sensory information to honor their low thresholds so they may engage in useful routines and habits. Discriminating movements are those that repeat in a simple sequence much like rocking in a rocking chair. These repetitive head and body movements help to calm a child who is overstimulated. Having sounds repeated in a rhythm through a simple sequence or beat is discriminating as well. Now that we know that repetitive, linear movement helps to organize us, what would happen if this was paired up with a frightening sound? Balloon Pop does just that. 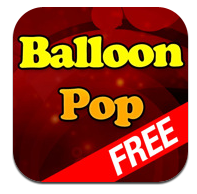 In order to pop the balloon, you need to shake the device up and down. Do this is a rhythmical fashion and the child is using linear movement while the balloons pop. The sound turns into a simple beat instead of an unpredictable surprise. See if this helps you Avoiders acclimate to the sound. Never underestimate the power of stories. Try adding a tale to deal with upsetting noises and events. 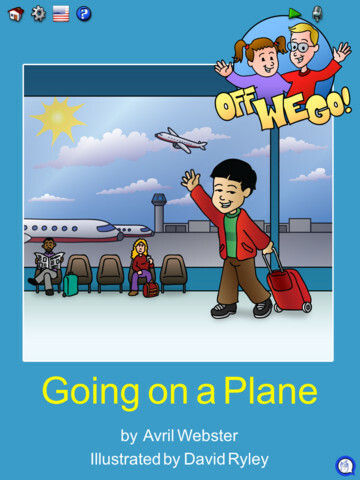 The Off We Go book series fit the bill. Two of the books are made into apps. 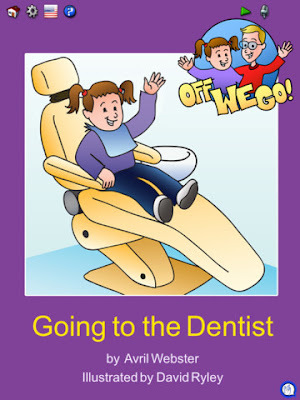 Going to The Dentist book app helps kids get ready for a dentist visit in an appealing way. They'll see what is likely to happen and hear some of the typical sounds from the dentist’s chair. Airports and plane trips can be initimdating and frightening to a child. Going on a Plane book app is just the thing to read to help prepare for this journey. These are both QBooks, an interactive digital picture book format by Kiwa Media. If you are not familiar with them, you are in for a surprise. Run your fingers over the text to see the words come alive (words seem to dance on the page as you hear the story). Touch any word to hear it said or spelt. Color in the book pages. 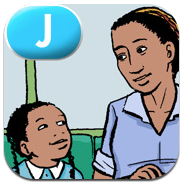 Kids can record themselves or their parent, so that even the narration is a familiar comforting voice. Both apps are $3.99, well worth the price if these experiences are unsettling. Watch them in action in this video and see if you don't agree. Choose any of the apps below to expose the student to specific noises while giving them the ability to lower the volume or to turn it on and off. One fourth grader at my school is particularly sensitive to gum smacking. As I observed her in PE recently, she was trying to avoid a peer who was chewing loudly. When she was assigned to the team with this child, she looked up incredulously and muttered, "You mean with the girl chewing gum?" Instead of joining the team, she inconspicuously assigned herself to another team. How can we help children adapt to noises that cause them to flee from situations? 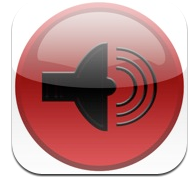 There are many apps that target particularly annoying sounds. Not surprisingly, most have "annoying" in the titles. 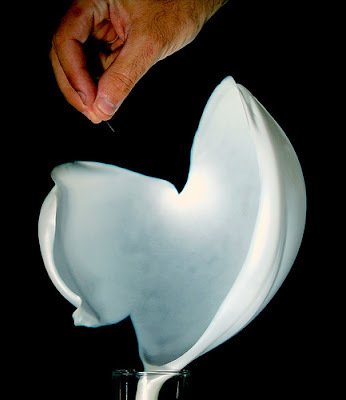 Use these to target environmental sounds that are disturbing to an individual. Have the student control the volume when experiencing them. The first one is Annoying Sounds - Free Sound Effects Boards. It has a quick on-off button, but you have to use the iPad volume button to lower the sound if needed. The sounds are divided into categories: high frequency, alarms, animals, eating, emergency, human, office, phone, random and wake up. The school environment has a range of troubling noises. 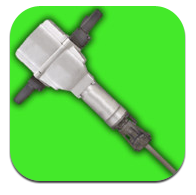 This app has them: fluorescent lights, coughs, blowing noses and clearing throats. Imagine the school cafeteria. It can be overflowing with upsetting sounds. 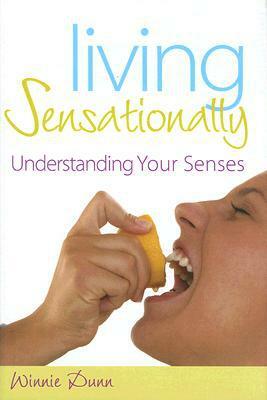 Look for slurping and smacking lip sounds under the "human" category to help kids desensitize. Here are some other annoying sound apps (all free). Both have a quick on-off switches and a repeat button. Volume needs to be controlled by the iPad volume button. Annoying Sounds! 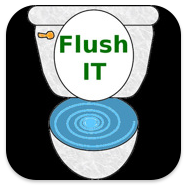 has twelve sounds, including hammering, in-sink-erator and garbage truck. Annoying Noises comes with 15 sounds including dripping, buzzing fly and a drone. If you feel you need more control for your Avoider, try Sounds Annoying! You can change the pitch, volume and filter using slider buttons. Did you not find the noise that you need to target? It has the ability to customize your sound if you buy the in app purchase option (99 cents). If there is a timer beep, a certain tick of a clock or a voice that may be grating to a particular individual, record it and use this for controlled exposure. Even the most everyday sounds can be bothersome to Avoiders. Part of Avoiders' ability to handle noise is through control. They can prepare themselves if they are in the driver seat. There are apps that target typical sounds in our world (animals, vehicles, environmental noises). Given the chance to choose the sounds and listen after controlling the volume, the Avoider can prepare their nervous system and desensitize to the noise. Sounds are not so offensive if the volume is turned down. 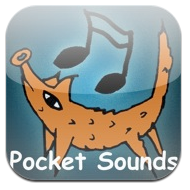 Pocket Sounds is a collection of everyday sounds. There are six pages with eight sounds on each. The first five pages are sounds of objects and animals. The last page contains longer sound clips to listen to while falling asleep, relaxing or doing homework. 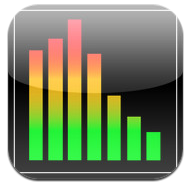 There is a large volume slider at the bottom of each page for quick access to sound levels (no need to fumble with the side volume button on the iPad). How would this encourage participation at school or home? Perhaps the students are going on a field trip. A child who may be bothered by the unexpected animal sounds can listen to farm animal sounds to become more comfortable in this environment. Is the fire department visiting the school? Expose the student to emergency sounds to explore. Going on a vacation? Have your child listen to airplane, traffic and crowds of people. Opening day is less than three months away. Listen to the crowd "boo" (especially helpful if you are at Fenway and the Red Sox face the Yankees). Finish the session with a favorite relaxing sound on the last page. Remember, Avoiders do well with routine, so stick to one song they enjoy. I like the garden sounds. It makes me feel like spring can't be too far away! Being an Avoider does not stop at childhood. These sensory processing patterns tend to stay with us throughout life. Hopefully the more we understand our sensory selves, the more we can develop strategies to help us navigate through life. Having grown up in a large family, I am used to a significant amount of auditory chaos. I can generally tolerate a noisy working environment. This suits me in my current job as I work with students in a variety of natural environments: classrooms, loud cafeterias, boisterous playgrounds and gyms with poor acoustics. 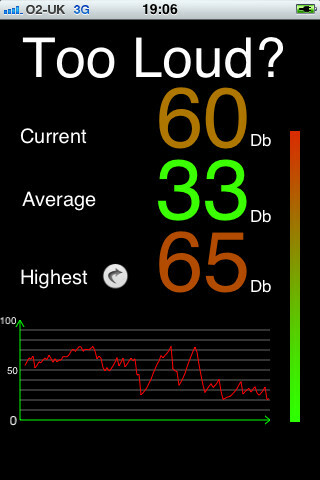 Each classroom has different noise levels. I think this reflects the range of tolerance individual teachers have for sound. If a teacher is an Avoider, the classroom is probably more structured and quiet. If a teacher is not bothered by noise, the sounds of students working and playing are more noticeable. The TooLoud! 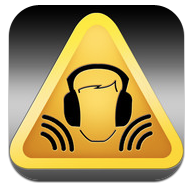 app is ideal for the teacher who needs to limit noise in the classroom environment. It records decibels, displaying the volume levels in numbers. Use it to let the class know when they cross the auditory line. Hook your iPad up to the projector and manage the working noise level in class by letting the students see the feedback for themselves. The data is also visualized in a live graph and in a sliding bar that indicates the rising levels of clamor and babble. Watch out for the red zone...time to bring the level down!